Blood type: AB Height: 5' 7" (173 cm) Date of Birth: August 11 or August 19 Age: 16 (FF Before Crisis, FF Crisis Core) 21 (FFVII) 23 (FF Advent Children) 24 (FF Dirge of Cerberus) Birthplace: Nibelheim Main protagonist in Final Fantasy VII. He has blonde hair and vivid, blue eyes, and is a featured SOLDIER member. His shimmering blue eyes are a sign of having been exposed to mako energy from Shinra. By the beginning of the original game Cloud is a mercenary working for the AVALANCHE group. 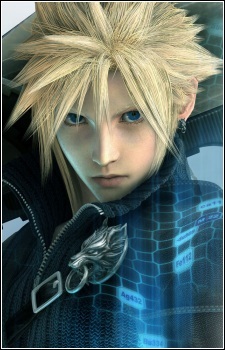 At first, Cloud displays a cold and uncaring demeanor, but he gradually adapts to his role as a leader. Aerith and Tifa are potential love interests for him. Later, as the game proceeds, it is revealed that after Zack Fair's death, Cloud loses his memories and his mind gets supressed by the Jenova cells within his body, making him believe that he is Zack. (The cells taking control over his body (as a result of intensive geostigma) can be seen in Advent Children, too, the moment Cloud stands before Zack's grave and in the church, making him lose consciousness and fall to the flowerbed alongside defeated Tifa.) A major part of the original FFVII is devoted to the subject of Cloud regaining back his memories and understanding who he really is. In the movie Cloud and Tifa run an orphanage. Cloud seems to be avoiding contact with his family as he believes that he is of no help to anyone. He still blames himself for being unable to save Aerith Gainsborough from being killed by Sephiroth. He is now also infected by geostigma, so he gives up all hope as there is no cure and is expecting to die. He, nevertheless, manages to regain self-confidence and faith before he defeats the memory of Sephiroth once more. His Geostigma is also cured in Aerith's Church, with the power of the lifestream within the rain and water. Cloud is also the only successful "Sephiroth Clone", in other words, the inheritor of pure S Cells. He was unknowingly injected with them by Hojo of Shinra's Science Department soon after the Nibelheim Incident.